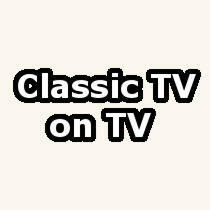 Classic television digital specialty network Me-TV, currently available in 92% of the country, will premiere its fall schedule on Monday, September 1st. Anyone hoping to see the addition of more short-lived shows will be disappointed. Most of the shows making their debut on the network are well-known and long-running: The Andy Griffith Show (in select markets), The Adventures of Superman, The Man from U.N.C.L.E. and CHiPs. Take a look at the new schedule: Eastern/Pacific or Central/Mountain. Fans of The Rebel probably won’t be seeing that show on Me-TV this fall. Currently it airs at 11AM but starting September 1st will be scheduled as alternate programming at 10:30AM for stations that do not air the Saturday morning educational/informational shows. Mr. Lucky, currently seen at 2:30AM Monday morning, will shift to 4:30AM starting September 1st. There are also a number of shows returning to the lineup after taking a hiatus, including That Girl, The Rogues, The Bob Newhart Show, Cheers and Voyage to the Bottom of the Sea. To make room for all these changes, quite a few shows are taking a break, including The Mod Squad, The Twilight Zone, The Honeymooners, The Phil Silvers Show, Kojak, The Fugitive and Wagon Train. The Me-TV website has a page dedicated to its Fall 2014 schedule, which you can find here. A lengthy overview of the schedule can be found at The MeTV Monitor blog. Excited about the new Me-TV fall schedule? Disappointed? Either way, hit the comments with your thoughts. METV has made a terrible decision to drop the Twilight Zone. My wife and I will not be watching METV every night as we do now. Folks, for practically any classic series, you can purchase entire box set DVD series runs online to watch at your convenience. One need not be dependent upon TV for that. DVD players are operated by the simplest of commands. Hate to see BILKO and CAR 54 going on hiatus, but at least it is just a hiatus and not a permanent leave. Glad to see F TROOP remaining on the schedule, along with WELCOME BACK, KOTTER. Glad to see THE ROGUES coming back, and BLACK SHEEP SQUADRON being added; haven’t seen it in a long time. As for TWILIGHT ZONE, with the entire run still streaming on Netflix, that’s OK too. Are you going to bring back Hawaii with Jack Lord? If so, when? Thank you. Any chance of Antenna TV adding classic reruns of Dancing With The Stars to their lineup? This show is a vintage classic now being on TV since 1998. I’d love to see the classic episodes of American Idol and So You Think you Can Dance. Everyone loves these shows, and they’ve been on the air long enough to be considered true TV classics. I’m also a huge fan of Everybody Loves Raymond and Two and a half Men. These shows are the two best comedies ever made. Hint, hint Antenna TV?? Taking away Wagon Train, Wanted Dead or Alive and The Rebel, bummer :-( . But Twilight Zone?????? Dang! Understand the need to switch it around but please bring them back soon, especially The Honeymooners. The shows I was watching have been moved around so I won’t be able to watch them anymore. The shows I’m tired of were left alone. Bring back The Twilght Zone!!! Cheers…??? Please anything but that. So sad to see Wagon Train go. No Fugitive?Best show ever on tv.Please bring it back. I missed it too. I made a big deal out of Sunday at Midnight for two year’s.I posted each episode on Facebook an hour before it came on. I remembered the show vividly as a child. The show literally inspired me to hitchhike most of the country as a teenager. Truly a one of a kind show. I liked MeTV keeping with it’s once a week showing, as well as the original progression of the series. That should remain so when it comes back. A truly fascinating series. I agree. The Fugitive was one of the few shows I tried to catch each week. What the Hell happened to the Honeymooners???? Wow, I got up at 5am every Saturday just to watch 12 O’Clock High, then Combat! Saturday mornings won’t be the same. Cheers? I hate it! I sure miss Wagon Train. Bring it back soon! I am going to wagon train really bad I want it back really soon that’s the only thing I watch on METV. PLEASE bring back wagon train,for over a year we had coffee together at 3;00 am, mon-fri, also on sat. mornings at 10.30 am. This is a GREAT channel, i hope you stay with us. I am very disappointed about losing Wagon Train. I would wake up at 4:00AM every morning just to watch it. I sent my complaint to the Network. I sure hope they get enough complaints to bring it back soon!! For me many of the shows on their schedule are overexposed at this point. I like it better when classic TV networks show obscure shows rather than the same old shows that have become tired and worn out. I do like some of their additions though. I’d just like to see more hidden treasures. My wife and I have been enjoying watching Wagon Train for several months now. It is very relaxing to come in from a long haul drive and be able to just sit back and see how times have changed. I see a lot of the country and it makes you really think what history has taken place in the different areas. I was so disappointed that you have taken off the Big Valley, during the week. it is only being shown now on Saturdays. Your new Line up, is not quite up too par.Please bring back The Big Valley during the week. it was the main reason i watched this channel. I was so excited to discover METV and your weekday line up of the Twilight Zone, Alfred Hitchock, and Thriller. Now that you have removed them, sadly there no reason to tune in! Before this station became Me they aired Ellery Queen. Could you add it to your line up? It is a great show and I miss watching it. Ditto !!! I loved seeing Alfred Hitchcock, Thriller & Twilight Zone. I really miss those shows. Also, THE FUGITIVE and THE HONEYMOONERS !!! These shows are the the reason I would watch Metv so much !!! At the very least, Metv could have broadcast the entire series of The Fugitive; especially when “Kimble” catches the “one armed man”, then (as they say) give it “a rest” . This was the first time I was able to see a show that was very popular during my childhood, and I can see why my family loved it. I can’t believe Metv just yanked these shows and replaced them with comedies !!! Now, I have no need to watch Metv as much as I did before. Me too. I tuned in to see “Get Smart” an I start sweating in desperation like a heroin addict. I want to thank you for your programming , lots of mem: I only watch me TV I hope you do the same on internet. (Live tv) you can get it everywhere. The Fugitive was in a bad time slot. When you bring it back, it should be 10pm eastern time , the way it was originally on ABC…..good to see some new additions to the schedule…….. When will the Fugitive be back??? Can we show it a little earlier next time??? Bring back honeymooners please its the only reason why I tune in!!!! I was disappointed that they dropped The Fugitive. I’d been recording it every week for about two years. Was very disappointed that the fugitive was taken off. It was the best show on your station. Now I have to watch it on you tube. Please, please, please put Doctor Kimble back on at least a weekly regular viewing schedule as soon as reasonably possible. There’s no better drama then or now!!! I miss Kojak! Please bring back Kojak! I love that show so much! When I was little, WNYW Fox 5 would air Kojak on Sunday afternoons at 4pm! I am 32 years old, and am a fan of this show! I’m a fan of Adam-12. I remember this show when I was a very young child when it was still on network television. I’ve noticed recently that the episodes MeTV is showing of Adam-12 have some serious audio issues. Mainly a high pitched whistling shrill heard in many parts of the show’s dialogue in many different episodes. I also noticed that the whistling shrilling sound is in the episodes that don’t have the original “Mark VII” Productions logo. These episodes were obviously sourced from worn 16 MM syndication prints and were given digitized color corrections, but the audio is terrible. Please bring back Hazel and no more Patty Duke Show. Anybody who cancels The Twilight Zone is obviously a buffoon. You have ruined your station. I loved the twilight zone 12 oclock high and then combat. Bring back kojak and honeymooners. Crocker!!! I watched the Fugitive TV show every Sunday. I am so disappointed it was taken off. It is my favorite TV show of all time. Please bring it back. My second favorite TV show was Wild Wild West. Please bring that back as well. Thank You. I pleased to see my all time favorite comedy: The Mary Tyler Moore Show back on MeTV. But I’d rather it be on in the evening because it’s not too convenient to watch TV early in the morning for me. Anyway, I’m still glad that Mary’s back. Please bring back The Fugitive. That is my all time favorite series. It was on in a bad time slot – midnight on Sundays. I’m reading so many comments from people who are disappointed in its absence. Really, there’s not a time that this great series wouldn’t work? I’m a little nostalgic, how about bringing The Fugitive back on Tuesday nights, just like the old days. Give it a chance at an earlier time and you will not regret it! I too love The Fugitive. I even got my daughter hooked. Can’t believe the loser shows on now. I just switch MeTV off. I have bought a few videos but love to watch late in evening. Please bring back “That Girl” great show! I continue to watch “Naked City” late on Sunday nights, and truly enjoy it. “Route 66” works for me, as well. But I am still bitterly disappointed with the removal of “The Fugitive”. It was the high point of my week. I find the current schedules for Me-TV, Antenna TV and Cozi for the most part as unwatchable as those programs were when new. Would like to see the avengers-little raschals-superman-crime time after prime time. Wish ya’ll would put Nash Bridges on, Kojack, and Quincy back on. When are The Untouchables coming back to Me Tv . We hope soon and not so late at night. Takes a little adjustment when my favorite shows are moved or replaced w/others shows but you have to keep everyone watching happy…. So, how about “Mannix” !?! I’m so glad LaVerne and Shirley were brought back. I love this show.